JSSC IRB Constable Result 2018 released on 6th June 2018. Merit List of Jharkhand Police IRB Constable Competitive Exam (CCE) 2018 (OMR Based) conducted in December 2017 is available for download on www.jssc.in. Link of downloading merit list is given below. List of selected candidates for Jharkhand IRB Constable Physical Test 2018 is attached below. The merit list contains the roll number of shortlisted candidates for PET / PMT. Name wise Jharkhand IRB Constable Result is not available. Also schedule of Physical test for the selected candidates in IRBGCCE 2018 Exam and venue of the test is given below in PDF file. Therefore, check all the latest information and updates on JSSC IRB Constable Merit List 2018 and physical exam. 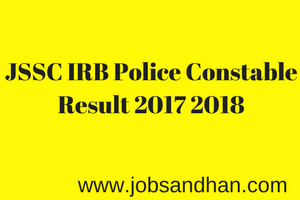 JSSC IRB Constable Result 2018 (written test conducted on December 2017) – Click here. Schedule of Physical test & Location (Roll number wise) – Click here. Answer key for the Jharkhand Police Constable Exam has been released. Earlier, exam has been successfully conducted by the JSSC.in authority for the IRB Constable Posts online test on the 3rd December, 10th December and 17th December 2017. Result will be released in the year 2018. Also comment down below regarding your expectation about cut off marks for Jharkhand SSC Police Constable Cut Off Marks 2018. Download Answer Key for the exam held on December 2017. JSSC IRB Constable Result 2018 Expected cut off marks will be discussed here. Jharkhand SSC IRB Police Constable 2810 posts recruitment exam was held on 3rd, 10th and 17th Dec of last year. Jharkhand SSC earlier advertised notification regarding the Jharkhand SSC India Reserve Battalion police constable vacancy on the official website which is www.jssc.in. JSSC IRB Constable Result 2018 is expected to be published in January or February 2018. Computer based exam was conducted in 3rd, 10th and 17th December 2017. The Jharkhand Staff Selection Commission will soon publish the result of the recruitment exam (CBT) on their official website of www.jssc.in. Candidates must cross the JSSC IRB Police Constable Cut Off Marks for getting into the second stage of recruitment which is physical steps. Below we have discussed some important information regarding the publishing of JSSC IRB Police Constable Merit List 2018 and expected publishing date. Organisation Jharkhand Staff Selection Commission. Exam Name Jharkhand Police Constable Exam. Exam Date 3rd, 10th & 17th December 2017. Result Status April Last Week 2018 (Expected). Jharkhand SSC will publish Computer Based Test Result for the IRB Police first. Jharkhand Staff Selection Commission is the main recruitment authority for the 2810 vacancy of India Reserve Battalion Police Constable in 2017. The board had earlier declared the exam dates of Jharkhand India Reserve Battalion exam date as 3.12.17, 10.12.17 and 17.12.17. The written test consisted of Multiple Choice Questions or MCQs. Candidates had to answer the questions on Computer as it was a CBT exam. Jharkhand State Related Questions 50 Marks. General English and Grammar 50 Marks. Sahitya, Language Knowledge, General Knowledge 20 Marks. 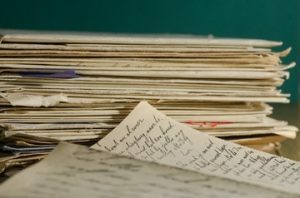 Hindi Sahitya and Grammar 40Marks. d, we will update here the link of checking the result online. Exam Date – 3rd, 10th & 17th December 2017. Expected Publishing Date of Result of Written Test / Online Test – NA. Merit list will contain the names of shortlisted candidates who have crossed the cut off marks as per their individual category. Shortlist may also be published for the CBT or may not be. Individual merit list for SC ST OBC category candidates may also be checked if the merit list is published. Earlier it was stated that the JSSC IRB Constable Result 2018 will be available by April 2018. But May is also over, so it is expected that the JSSC IRB Police Constable Result News 2018 will be come soon in June / July 2018. So, keep visiting us to get updated information regarding the publishing of Jharkhand IRB Constable Merit list and latest news and expected publishing date. Also refer to the cut off marks below to get the probable qualifying score in the written test conducted on December 2017. Jharkhand Staff Selection Commission Expected Cut Off Marks for the CBT may be discussed in the comment section. You can write your category and expected marks obtained in the exam of the JSSC India Reserve Battalion Police Sipahi Exam 2017, so that. A rough idea can be obtained regarding the cut off marks. SC Cut Off Marks, ST Cut off Marks, General Cut Off Marks will be different for the examination. Candidates should not wait for publishing of JSSC IRB Constable Result 2018. They should take preparation for the next step that is physical exam. Do not worry about publishing date of result. We will update the link when it is published. For more information regarding Exam Result, Cut Off Marks for various govt jobs – visit our homepage www.jobsandhan.com. If you have any queries, you can share in the comment box. Log on to the below link. Find the tab Police Constable Exam result and click on the link. Now you can see individual result on their official website. If you have any other query or information you want know, then please visit the JSSC official website. Regarding Certificate Verification, the Jharkhand SSC has released some notifications, please download the notification below if you are concerned to check about the Jharkhand Staff Selection Commission Police Constable Recruitment Test 2015. Exam Result for Jharkhand Staff Selection Commission (JSSC) Police Constable Post for which the written test was held on 30-01-2016 and 31-01-2016. Jharkhand SSC has stated in the month of august 2015 that the recruitment would be done for the above said post. JSSC had declared that around 7272 Constable will be recruited. The admit card for the written exam was available online from 05-01-2016. The candidates who filled up the application form successfully were able to appear in the written exam. Now they are waiting for the results which will be published by JSSC board. The candidates who were eligible to fill up the form, has given a vast time for application. The method of application was via online only. It had started from 28-08-2015. Last date for applying online was 25-10-2015. Exam Fee for the general candidates was Rs 200 only. The reserved candidates that is who belong to SC and ST category, had to pay Rs 50 only for applying online. Please note that the result of the above said exam is not published yet. Please visit the page periodically to see latest update about the Jharkhand constable recruitment 2015-2016. We will keep updating about JSSC exam as per the board’s notification of result. Sir Mera 315 no ho Raha ha or Mai ST category me aata hu . Or Mera certificate verification 9 Oct ko hai … Mera Merritt me aane Ka chance hai…..??? irb constable ka result – jald hi aanwala hai. Sir me Delhi se hu Pls btaiye ki girls ka cutt off kitna jayega mere 260 marks he kya mera ho payega jssc irb me . kis state se ho? ?kis din exam tha?? Tumhar result 100%ho jayega sapna.